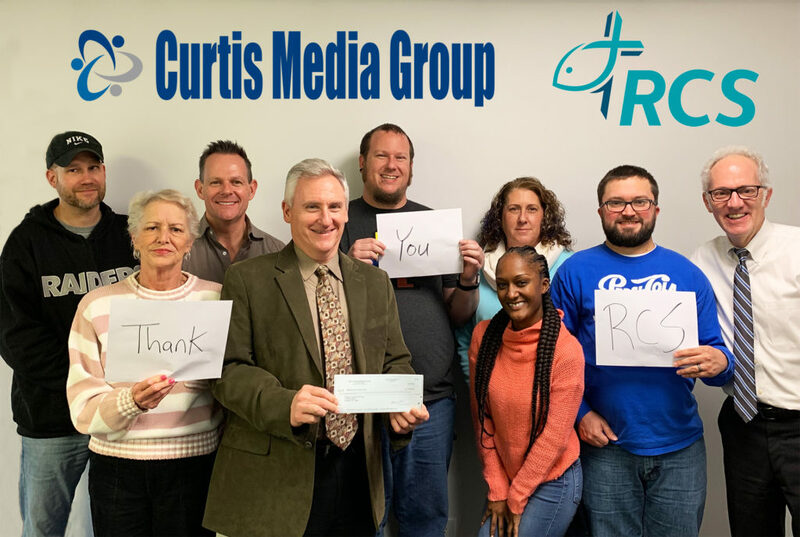 New Bern, NC – Curtis Media Group, North Carolina’s largest radio operator, is assisting with Hurricane Florence relief efforts by donating $10,000 to United Way of Coastal Carolina and $10,000 to Religious Community Services of New Bern. 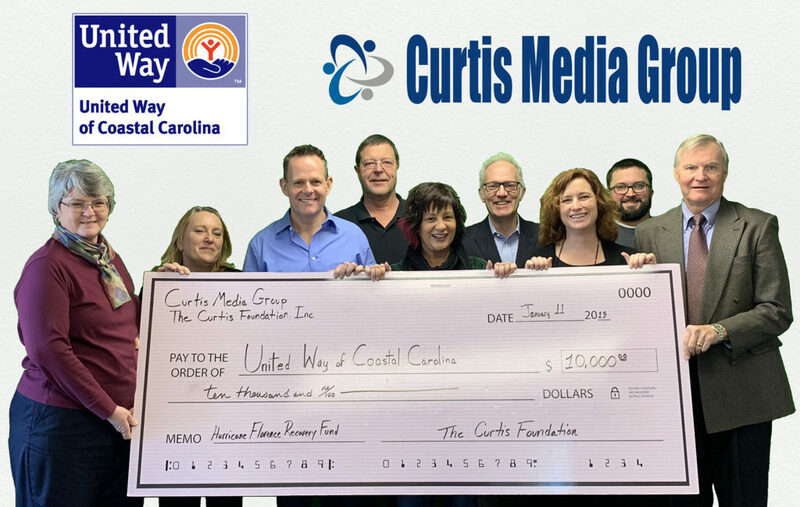 United Way of Coastal Carolina established The Hurricane Florence Recovery Fund to address the needs of those affected by this devastating storm. The fund will assist those affected in Carteret, Craven, Jones and Pamlico Counties. United Way has been working with disaster related long term recovery groups in the Coastal Carolina region since late September. Religious Community Services is helping lead Hurricane Relief Efforts for the Craven County area. They are committed to addressing the basic needs of the community by providing food, clothing and shelter to those who need it most. Shown left to right is Sandra Phelps, Executive Director of UWCC, and members of the Curtis Media team which operates radio stations 106.5 WSFL, 103.3 WMGV, HOT 99.5, The Beach Boogie and Blues Network and 101.9 KISS FM. About Curtis Media – Curtis Media is NC’s largest radio operator with 62 radio signals across the state of NC. In Eastern NC Curtis owns 5 leading radio stations including 106.5 WSFL, 103.3 WMGV, The New Hot 99.5 WXNR, 101.9 KISS FM WIKS, and the Beach Boogie and Blues Network. Together these stations reach a weekly audience of more than 356,000 people. Curtis Media also owns the ACC Sports Journal, ACCSports.com, Triangle traffic, Southern Farm Network, and the NC News Network heard on 80 affiliates across the state. For more information, visit ENCRadio.com. About United Way Of Coastal Carolina – For 60 years, United Way of Coastal Carolina (UWCC) has worked in Carteret, Craven, Jones and Pamlico Counties to improve the lives of people in Coastal North Carolina by mobilizing the caring power of people and communities. Today, UWCC is the one of the largest private funders of education, income, and health services in the four-county area. Over the past ten years, UWCC has provided over $3 million in grants to over 20 non-profit agencies working throughout our service area. UWCC strives to make sure children are ready to learn, families are safe and self-sufficient, and seniors remain independent and active. UWCC brings together experts, business leaders, donors, neighborhoods, and members of local non-profit agencies. For more information visit unitedwaycoastalnc.org. About Religious Community Services – Religious Community Services (RCS) of New Bern has many thriving programs that help nourish the whole person: mind, body and spirit. Programs include: clothing closet, financial assistance, food pantry, food recovery program, homeless shelter, shelter dinners, soup kitchen, S.T.E.P. career training, Sunday morning breakfasts, and transportation and prescription assistance. For more information visit rcsnewbern.com. Copyright CMG Coastal Carolina LLC. All Rights Reserved.